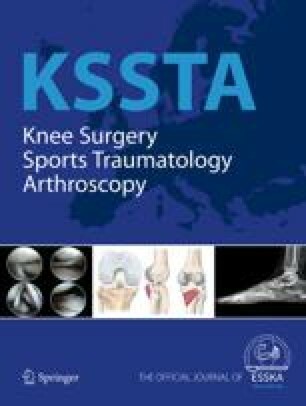 The purpose of the present study was to determine the effect of biological in-growth and pre-tensioning on the load transmission function of meniscal transplants. The ability of meniscal transplants to transfer load to the tibial plateau was measured in an animal model. Thirty-six sheep were divided into six groups: group A was the sham group, in group B a medial meniscectomy was performed, and in groups C–F a medial meniscal transplantation with an autograft was carried out. In groups C–F, different levels of pre-tensioning force were applied via bone tunnel sutures (C=0, D=20, E=40, and F=60 N, respectively). The animals were killed after 6 months. The excised knees were mounted in a materials testing machine at 30, 60, and 90° of flexion, and loaded through the femoral axis to 500 N. A thin film pressure measuring transducer (K-scan, Tekscan®) was positioned underneath the meniscus in the medial compartment in order to determine contact area and pressure. The mean contact pressure (MCP) of the sham group (A) and the groups with the transplanted meniscus (C–F) was significantly lower in relation to the meniscectomized knees (B). Significant increases in contact area and reductions in peak contact pressure were also observed. Only the meniscal transplantation group with 40 N (E) pre-tension consistently showed a significant or strong trend toward increased contact area, compared to the meniscectomized knees (B) at all flexion angles tested. All meniscal transplanted groups with the exception of the 0 N group (C) showed a significant reduction in peak contact pressure in comparison to the meniscectomized group (B). The results indicate that meniscal transplantation reduces the MCP on the tibial plateau independent of the level of intraoperative pre-tensioning. Furthermore, the menisci pre-tensioned to 40 N showed significantly increased contact area and reduced peak contact pressure in comparison to the meniscectomized knees at all flexion angles tested, and revealed results similar to those reported in the literature for meniscal allografts fixated with bone plugs. This study was supported by the “Hochschulinterne Leistungsförderung” of the Hannover Medical School, Germany.